“She was always a really tough opponent so it's no surprise that she's gone on to have a great professional career. 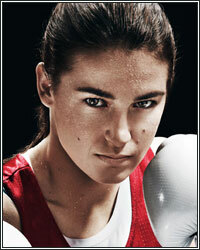 I think this fight will really showcase the best that women's boxing has to offer and I'm really looking forward to it. For more information, visit www.goldenboypromotions.com, http://www.matchroomboxing.com, and DAZN.com. Follow on Twitter @GoldenBoyBoxing, @Canelo, @Rocky87Fielding, @MatchRoomBoxing, and @DAZN_USA. Become a fan on Facebook at www.facebook.com/GoldenBoyBoxing, www.facebook.com/SaulCaneloAlvarez, www.facebook.com/MatchroomBoxing and https://www.facebook.com/DAZNUSA/. Follow on Instagram @GoldenBoyBoxing, @Canelo, @Rocky_Fielding, @MatchroomBoxing and @DAZN_USA. Follow the conversation using #CaneloRocky.